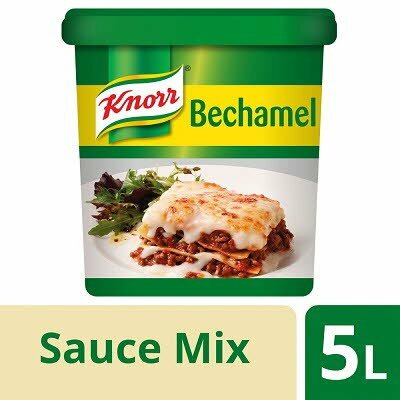 A classic béchamel sauce mix for a white sauce. Maltodextrin, skimmed MILK powder (18%), palm fat, modified starches (corn, potato), WHEAT flour (10%), salt, potato starch, lactose (MILK), sugar, onion powder, yeast extract, flavourings (contain MILK).May contain egg, celery and mustard. Stir 210 g in 1 litre of boiling water and cook for 2 minutes.